In our almost 5 years of marriage we've never had a headboard. We spent all our money on a really nice mattress (that we still looove) and got some cheap bedside tables and a dresser at a garage sale and called it good. The lack of headboard just wasn't a big deal. But I've recently decided that I really do want a headboard now. It would make our room seem so much more polished and so much less young-marrieds-can't-afford-furniture-ish. As Aaron and I have discussed it we've both decided we really want an upholstered headboard since we're both the read-in-bed type and like something comfy to lean against. 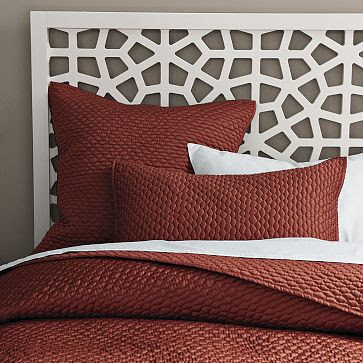 Even though we're looking for something softer, when I stumbled across this Morocco headboard from West Elm I couldn't help go, "Ooooh!" I love the cutouts and that you could do a million different things with bedding and it would all work beautifully (not the case with the gray and cream striped one that I really want...). And I really love the white against that gray wall. Ah to be able to paint again! I LOVE this. Of course, I love practically everything from West Elm. My main worry about an upholstered headboard is that it would get dirty.